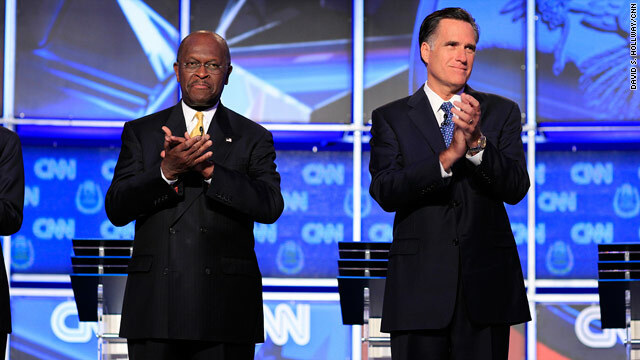 Washington (CNN) - Two new polls show front-runners Mitt Romney and Herman Cain in close competition in two states with early primaries. According to NBC/Marist Polls released Wednesday, former Godfather's Pizza executive Cain edged out former Massachusetts Gov. Romney in Florida by one percentage point and in South Carolina by four percentage points. But the results are within the poll's sampling error. The Florida numbers show Cain with support from 32% of likely GOP voters, while Romney garnered 31%, Texas Gov. Rick Perry 8%, and both Texas Rep. Ron Paul and former House Speaker Newt Gingrich 6%. When surveying a wider swath of Republicans in Florida, 30% of respondents chose Romney as their candidate while 29% chose Cain. Those numbers include a sampling of all Republicans in the Sunshine State, rather than just likely GOP voters. The poll also shows a tight matchup in Florida between Pres. Barack Obama and his GOP rivals. When paired with Romney, Obama received 45% and Romney received 43%. The gap was bigger with other potential rivals, including Cain. In that pairing, Obama got 47% compared to Cain's 41%. In South Carolina Cain took 30% of likely GOP primary voters, with Romney following at 26%, Perry at 9%, Gingrich at 6%, and both Minnesota Rep. Michele Bachmann and Paul at 5%. The broader pool of Republicans in South Carolina showed Cain received 28% of the vote and Romney 27%. Both South Carolina and Florida are considered key voting states in the early primary and caucus season. South Carolina has scheduled its first-in-the-South contest for Jan. 21, and Florida will hold their primary on Jan. 31. The South Carolina survey was conducted by telephone Oct. 11-13 from 630 adults, and had a sampling error of plus or minus 3.9%. In the Florida survey, 524 adults were polled by telephone between Oct.10-12. The sampling error in the poll was 4.3%. hey i wonder what america will be like when corporations are in charge, does this means every one for themselves and the fittest survive. what will it be like for struggling folks when the repugs cut government and they no choice but to fight for the one jobs 10 people with way better skills already are fighting over. i wonder if they will blame government when they vote to get rid of government and put corporations over us. i am just wondering. It was interesting to watch the last republican debate. To see ROmney lose it was priceless. It was great to see Perry wake up. It was a pity that Huntsman boycotted the debate. any repub. out there explain to me why Herman cain is at the top of the GOP field when his 9-9-9- plan would raise taxes on 84% of people mostly all poor and middle class but yet when president obama recommeds raising taxes on people making over 1 million dollars he is called every name in the book by repub.? don't get it. GOP is such a circus. Obama will trounce them – any of them – in 2012. I'm confused...why would "anti-tax conservatives" support Cain, whose 9-9-9 tax scam would RAISE INCOME TAXES ON 84% OF AMERICANS? Of course those are the poor and middle class. Talk about class warfare. Just another scam to give more government giveaways to the rich and oppress everybody else. Disgusting. Hey, I wonder what America will be like when corporations are in charge? Worng question. When is America going to wake up to the fact they have already taken charge, and are simply in the process of securing the perimeters. Better question. What is the difference between a society where government controls all of the businesses, and a society where businesses controll of the government? Answer: From the common man's perspective, there is no difference. Go Romney! ! We need you to finally put the final nail in America's coffin. Unregulate us to death please. And why you at it..., gut us like when you were the CEO of bain Capitol. We should be more like Cuba – Government control and everyone's equal. Down with Capitalism! Romney is a total flip-flopper. He will say anything to get elected and promise things he definitely can't deliver. The republicans have created an almost depression with unfunded tax cuts, unfunded wars, unfunded drug programs and they want us to trust them again? I don't think so. I see the big picture. Obama 2012! Four More years!!! Ron Paul constantly ignored in the media after the debates. This guy has a lot to offer everyone across party aisles. Peace, economic freedom, end of corporate cronyism, reduction in spending, lower taxes for EVERYONE. People take a stand vote with your brains not the media! The problem is that these guys think that businesses are going to be good citizens. That has proven not to be the case many a time. Enron is a good example of not being honest which is how SOX came to be. Paul also has this deluded notion that people are honest and follow his ideals all the time. Just not true here there or anywhere... Some people will get away with anything that they can. @king "hey i wonder what america will be like when corporations are in charge"? The single party Demo/Publicans are laughing at you King – Demo/Publican supported corporations are already in charge. They are telling you the same myth to get themselves elected. From Obama's empty rhetoric to Teabaggers scare tactics. Getting votes and keeping the Corporate Status Quo is all there is in politics now. why is ron pauls $1,000,000,000,000 budget cut not getting any coverage or getting attacked by the other candidates? its because he right thats why. just like hes right about the federal reserve, how bad keynsian(sp) economics is, the gold standard, our foreing policy causing hate against us, prohibition, protecting the boarder, size of gov't, education, and so much more. HE PREDICTED THIS CRYSIS WE ARE IN TODAY WHILE OTHER CANDIDATES WERE PROMICING OUR ECONOMY WAS FINE!!!! HOW CAN YOU NOT SUPPORT HIM KNOWING THAT!!!! RON PAUL 2012!!!!!!! !